The Yale Bands is a thriving cultural community. Its members are given opportunities to prepare and perform great music; learn about the arts and their place in society and international cultures; and develop skills to become leaders. Through a robust series of musical activities, many Bands members work with and become serious performers, conductors, composers, arrangers, writers, archivists, historians, photographers, producers, choreographers, media producers, critics, and teachers. Band members develop and master these skills through service to the University, performing and producing commencement music, benefit concerts, university ceremonies, theater shows, international tours, reading sessions for classes, and special events. 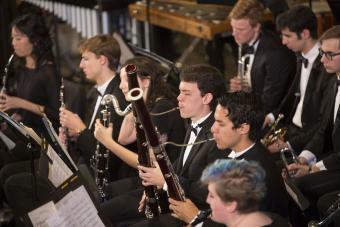 The Yale Concert Band is an ensemble of 45-60 wind, brass, and percussion players that perform repertoire ranging from wind band classics to premieres, commissions, and the newest wind band literature. The Yale Jazz Ensemble is a seventeen-piece big band that performs a wide variety of music, from pieces from Yale’s Benny Goodman archive to the newest, most progressive jazz compositions. The Yale Precision Marching Band is a scatter-style marching band that performs at Yale football, hockey, basketball, and other games throughout the year. Click here for information about the Yale Jazz Initiative. To celebrate the Yale Bands’ centennial season, we’ll be highlighting a different photo or document from the Band Archives each week throughout the 2018-19 season. Click here to see the current Centennial Moment. Click here to live stream an upcoming concert!